What do you get when you mix pediatric dentistry and Georgia football? 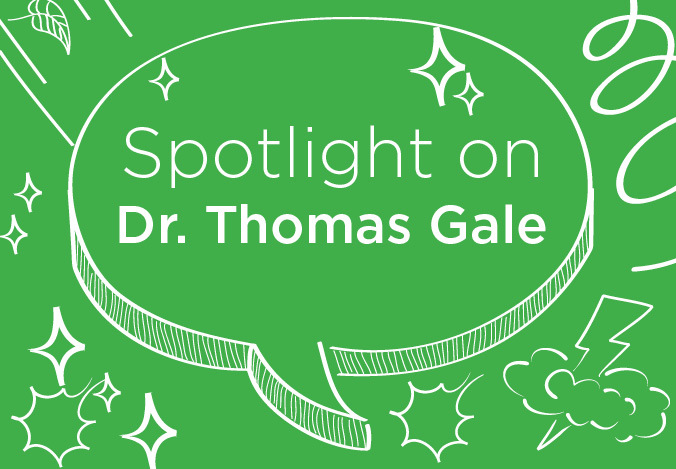 For the second interview in our series on dental consultants, we’re shining a spotlight on Dr. Thomas Gale in our Alpharetta, Georgia office. One part enthusiastic college football fan, one part dedicated pediatric dentist and one part collaborative Delta Dental team member, Dr. Gale is a whole lot more interesting than pop culture gives him credit for. We’ll start with an easy question. How long have you been with Delta Dental? And what did you do before joining the team? I’ve worked at Delta Dental for about five years now, and I’ve been a dental consultant the whole time. Before this I was in private practice for 20 years, specializing in pediatric dentistry. Okay, and what do you do here? What does it mean to be a dental consultant? I’m a consultant for our DeltaCare® USA, or DHMO-type, product. Basically, a patient goes to the dentist, who submits a claim for their work, and then I evaluate the claim based on the patient’s benefits. We make sure that claims are accurate. After reviewing a detailed summary of a visit and any x-rays, we determine whether or not coverage is applied fairly and appropriately. I’d also say that we advocate for both providers and patients. We want them to get most out of the available benefits. So if you had to summarize your job using an analogy, what would it be? I’m like a dental referee. If only that applied to Georgia football! Ouch — yes! A tough National Championship game for the Bulldogs. Speaking of challenges, what are the biggest challenges you face in your work? One of the most common issues is incorrect codes being submitted. For instance, a claim is submitted with the wrong tooth number, or is coded as a bridge retainer instead of a crown. It’s just human error, but it can greatly impact a claim and the patient’s experience if it isn’t reviewed. What do you like about your job? What about working at Delta Dental? I liked owning my own practice, but at a certain point it’s refreshing to be able to concentrate solely on the clinical side of dentistry. There is also a strong camaraderie here at Delta Dental. It’s nice to have other dentists you’re working with to review cases and get opinions. It’s just been great to work here. We like to think we’re improving peoples’ lives in some way every day. How do you think your team feeds into that specifically? From my professional background, I take a real interest in the pediatric cases that I review — especially when I’m able to make an impact on claims for children who are in pain. It’s important to me that I’m able to help them get the care they need as quickly as possible. Children shouldn’t be left waiting in pain. It’s especially important to create positive experiences for children as these may be the first dental experiences they ever have, and they’ll remember them going forward. A child with a positive perspective on dentistry is most likely going to become an adult who cares for their oral health. That is a great point. Other than reviewing claims, how do you keep your skills sharp? To remain a licensed dentist, which we all are, we have to do clinical coursework every year. Also, I like to think most dentists are tinkerers — we like to do stuff with our hands to keep busy. Many dentists have hobbies that require a lot of dexterity. Do you have any of those hobbies? Yes, I garden and I do some woodworking in my spare time. Recently, I’ve made some Adirondack chairs out of 100-year-old barn wood. As for my coworkers, my colleague Dr. Westee plays the bass guitar. She’s pretty cool! Going back to children’s first experiences, what is your take on dental phobias? They seem to have saturated popular culture. What’s it like to be in a profession with such a negative perception? With phobias, parents can actually help foster positive experiences. For instance, parents should get kids in to see the dentist early and often. You don’t wait for a high fever to take a child to the pediatrician for the first time, so why wait until kids have a toothache to go to the dentist for the first time? Make childrens’ initial dental experiences good ones — a simple cleaning, some tasty fluoride, a treat afterward, whatever it is! Just don’t let it be a filling or worse. That is a great point. Now for the fun stuff. What would your former patients be surprised to learn about you? I really enjoy mission work. I started out in 2007 in Peru, and my brother and I started a nonprofit in 2013. I’ve also been to Ecuador, but more recently I have gone to Nicaragua with a group of doctors and dentists to provide medical and dental care. That’s so cool. Have you noticed any differences between your clinical work in the US and mission work? Yes — a profound lack of access to care. People in Peru would walk three days to see us. One of the most profound experiences I had was witnessing people cry when numbed because it was the first time they’ve not felt pain in years. That changes your outlook on some things. On a lighter note, patients in Peru would sometimes bring their chickens with them so they didn’t get lost or stolen. Another big cultural difference. Speaking of a lighter note, what’s your favorite bit of dental humor? Like what you’re reading? Never miss a story by subscribing to Word of Mouth, our newsletter for benefits decision makers, administrators or HR professionals. Are you a broker, agent or consultant? Subscribe to our producer newsletter, Insider Update.